Cadre. 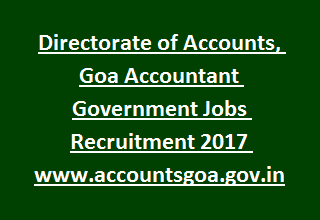 Candidates with essential eligible criteria are required to submit prescribed applications to the Office of the Directorate of Accounts, Goa on or before 24-11-2017. Application forms available on departmental website from 06-11-2017 to 20-11-2017 during office hours. Candidate must have completed Bachelor of Commerce or Arts with Economics from any recognised University and must have knowledge of Konkani and Marathi. Upper age limit of the applicant is 45 years as on date of advertisement. Pay Scale for Accountant Jobs is Rs. 9300/- to Rs. 34,800/- plus Rs. 4200/- (GP) per month. Application fee for all category candidates is Rs. 100/-. For more details of Application method, Selection process, Pay scale, Age limit, Application Fee of Directorate of Accounts, Government of Goa Accountant Jobs Recruitment are given below. Available vacancies in Directorate of Accounts, Goa Recruitment are 80 posts. Post Name: Accountant: 80 posts. Qualifications require for this Accountant post is Bachelor of Commerce or Arts with Economics from any recognised University. Candidate must have knowledge of Konkani and Marathi. Upper age limit of the applicant should not exceed 45 years as on the date of advertisement. Age relaxations for reserved candidates is 05 years as per govt rules. Monthly salary for Accountant Jobs is Rs. 9300/- to Rs. 34,800/- plus Rs. 4200/- (GP). Candidates will be selected for Accountant posts is based on their educational qualifications. Eligible candidates are advised to refer the guidelines and apply for Accountant Jobs using the Departmental website www.accountsgoa.gov.in. Application forms available from 06-11-2017 to 20-11-2017. Last date for submission of applications is 24-11-2017 before 05.00 PM.